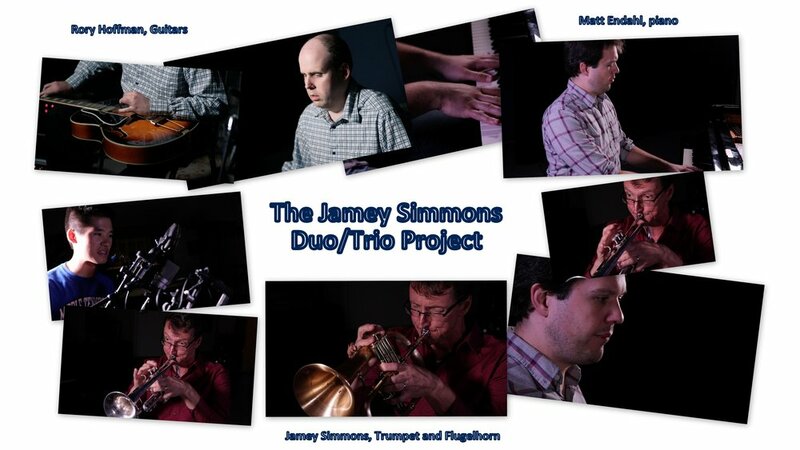 The Jamey Simmons Duo/Trio Project became a reality through the intersection of three musicians in Nashville educational and jazz performance circles: Jamey Simmons, trumpet, Matt Endahl, piano, and Rory Hoffman, guitar. The trio format of trumpet, guitar and piano is a rare one, challenging the players in unique ways. With the goal of bringing a unique group sound to the audience, we balance the tradition of jazz with the urge to explore new territory. Also, a Duo/Trio Project performance features solo and duo playing as well, reflecting the members varied tastes in repertoire. Here is the story of the Duo/Trio Project: One day, pianist Matt Endahl stopped by Jamey’s office at Middle Tennessee State University and said, “Want to play a tune?” Never before had the upright office Steinway sounded so good! Other lunch break opportunities arose for jamming, and we started getting a list of arrangements. The first duo recording took place in May 2017, with all four tracks available free on YouTube. The intersection of Jamey and guitarist Rory Hoffman happened at the Sunday night traditional jazz jam at Dalt’s in Nashville. Rory’s style and feel fit so well with Jamey’s interest in traditional jazz styles that a spring 2018 collaboration seemed natural. The track If I Should Lose You is available free on YouTube, with 2 other tracks waiting for release on our upcoming recording. The trio session naturally followed in August 2018 and is currently in the post production process. It will be available on CD and on YouTube in spring of 2019. Arranger, composer, trumpeter, and educator Jamey Simmons grew up in Wisconsin and knew early on that music was his unique gift. He earned his Bachelor of Music at the University of Wisconsin - Eau Claire and his Master of Music in Jazz and Contemporary Media at the Eastman School of Music where he studied under jazz composer and arranger Fred Sturm. Simmons is currently Director of Jazz Studies at Middle Tennessee State University where he teaches courses in jazz and directs Jazz Ensemble I. As a trumpet player, Simmons toured internationally with the Glenn Miller Orchestra. He is active on the Nashville professional music scene, and has made appearances with artists as diversified as the Temptations, Dave Weckl, Buddy DeFranco, Lee Konitz, Duffy Jackson, Vince Gill, Debby Boone, and the Nashville Jazz Orchestra. He has written arrangements and compositions that have been performed by the Glenn Miller Orchestra, the Rochester Philharmonic Orchestra, the Buffalo Symphony Pops, the Nashville Jazz Orchestra, Brussels Jazz Orchestra and numerous university ensembles. His first original jazz sextet CD, Gold Refined in the Fire, features New York saxophonist Scott Robinson. Active as a commissioned composer and arranger, Simmons’ published compositions and arrangements are available through Heritage Jazz Works/ Lorenz Music, Sierra Music, really good music.com and Kjos Music Publishing. Matt Endahl is a pianist, composer and educator working in Nashville. He has performed in groups led by Jeff Coffin, Rahsaan Barber, Duffy Jackson, Christina Watson, Marcus Finnie, Dara Tucker, and many others. He has also shared the stage with legendary figures such as Jimmy Heath, Arthur Blythe, Marcus Belgrave, Jane Ira Bloom, and Dave Liebman. Matt studied piano with Geri Allen at the University of Michigan, where he earned his master's degree in improvisation in 2012. In 2008 Matt was a Bösendorfer Montreux Jazz Solo Piano Competition semi-finalist, and from 2008-2013, he was on the music faculty at Hillsdale College. He has presented performances, compositions and research at the annual meetings of the International Society for Improvised Music (ISIM), the International Association for Jazz Educators conference (IAJE), Jazzanooga, the International Association for Schools of Jazz meeting (IASJ), the Detroit International Jazz Festival and Ann Arbor's avant-garde music festival Edgefest. From 2010-2013, Matt broadcast regularly on WCBN-FM Ann Arbor, hosting jazz and experimental music radio programs. In that capacity he interviewed music legends Henry Grimes, Mayo Thompson, and Larry Austin. Since 2008 he has managed Sound Mansion Recordings, an outlet for his experimental music. He also operates A Shot in the Dark, a blog devoted to his jazz and improvised music research. Find Matt online at www.mattendahl.com . Rory has played the Grand Ole Opry numerous times, as a soloist and as a sideman with Ricky Skaggs, Kathy Mattea and John Cowan. Working with these stars and others has enabled him to play several notable festivals, including Telluride with John Cowan, and Djangofest as part of the John Jorgenson quintet. He has performed in Norway, Italy and Jamaica thus far and deeply enjoys any opportunities to travel the world. When not out on the road touring, Rory is proud to be in several local Nashville bands, including 50 Shades of Hay, and the Gypsy Hombres. "Just Jazz Guitar" and "Guitar Player" magazines have written feature articles about Hoffman's unique guitar style. Rory is 2-time winner of Musician of the Year from Nashville's ICMA, and is a 2012 inductee into the South Dakota Country Music Hall of Fame. As a solo artist Rory has produced four recordings of his own: Blind Faith (2001), Fishin’ (2003), Swing Expedition (2008), and Tour de Fourth (2016). Find Rory online at www.roryhoffman.com . Jamey Simmons – arranger, composer, trumpeter, and educator. Learn more about Jamey and his music here.